We have been ‘YouTubers‘ for over 5 years now….. wow that’s crazy! We are nearly upto 1 million views over there and mainly share our Disney videos. We were in fact one of the very first to the party with our Disney vlogs. 5 years on we’ve loved and learnt so much and are still very much sharing all our Florida trips over there as well as venturing in ever so often, weekly even daily vlogging during October’s vlog-tober and December’s vlogmas in particular. If you too want to jump on the vlogging bandwagon then you’ve come to the right place…. 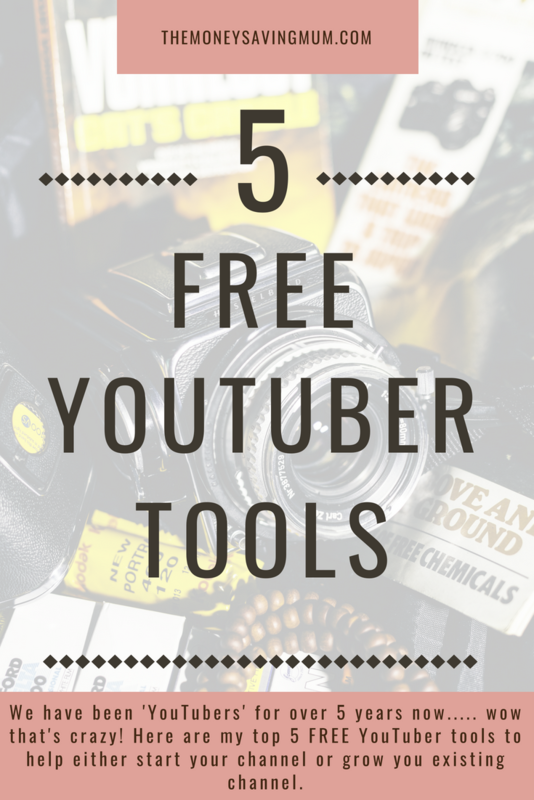 I’m here today to share with you my top 5 free YouTuber tools! We have used PicMonkey since customised thumbnails started being ‘a thing’ to accompany your video. Pic Monkey is a tool that actually costs now to download and save your created design but you don’t need to! TIP; screenshot it and if necessary crop it and there you have it…. your thumbnail! Canva is something I actually have a paid account for however it’s not for YouTube purposes it’s for my Virtual Assistant business. Free Canva is a great tool to have as you can make soooooo many templates from thumbnails to promotional images for Facebook, Pinterest and so much more! Tube Buddy is an extension to YouTube that again you can pay for if you want to but the free version is ideal. It gives you hints and tips to optimise each and every individual video. It does this by suggesting the tags you should use, best practice SEO audit and even the opportunity to see what tags other YouTubers are using on their videos. Morning Fame is a similar program to Tube Buddy in that it gives your hints and tips to optimise each and every video. It sends me through an email after 24 hours of every single video to tell me how it’s doing, where it’s ranking using the tags I’ve used and how my thumbnail is competing against other similar ones. I started with Movie Maker and looking back I can’t believe how rubbish it is. It IS however free! It’s on all Windows PC/Laptops and if you’ve never ever attempted to edit a video before it will do exactly what you need it to do. Once you get a little more advanced you may want to seriously consider looking for another programme but as I’ve already mentioned it’s FREE! Yes I realise that is 6 but there’s an extra one for you! Chances are if you are a YouTuber you will already know about this! There are other music libraries available, majority you have to pay for, but this one is free! So there you have it; my top 5 FREE YouTuber tools to help either start your channel or grow you existing channel. Apart from camera equipment and an iMac we haven’t invested in anything to help build our channel. There are things to buy, programs to purchase, software to download, apps to try but at the time of writing this post we’ve not bought anything and use everything mentioned above. If you got value out of this or feel it would be something a friend would love to read too then feel free to share!